Shuffle - Make as many words as you can with the letters provided including the 5, 6 or 7 letter target word to unlock the next level. The more small words you get, the bigger your score. Use the Shuffle button to mix the letters up and help yourself spot more words! Hexxed - Make words by tracing your finger through the tiles to make a chain within the hexagonal grid! Two play modes - limited tiles or limited time. Create long, interesting or unusual words to keep your word power score up and earn more tiles or time! Wordsearch - Find all the listed words within the grid of letters, horizontally vertically, or diagonally! Play using the standard dictionary, or choose from over 20 special lists of themed words! Gridlock - Make words by tracing your fingers through the letters to make a chain. As you make words this lights up the tiles. Light up the whole grid to level up! Use special tiles to boost your word power, score bonus points and more. Spellmaster - Challenge your spelling skills against words of increasing difficulty. Choose the correct spelling from a choice of 4 words, 3 of which are misspelled! Games of this nature should appeal to Nook Color buyers, and having it included in the on-device app store makes it easy for Nook Color users to download and enjoy them. Word Games costs $4.99, and of course is available from the Nook Apps Store. The full press release is after the break. 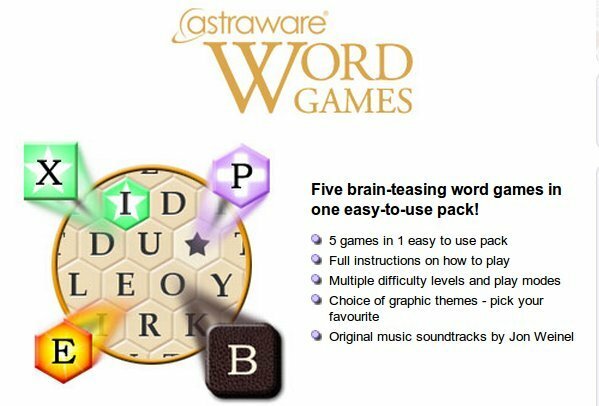 Staffordshire, UK - August 15 2011 - Astraware® is excited to announce the launch of their brand new word games pack, Astraware Word Games, exclusively for Barnes & Noble’s NOOK Color Reader’s Tablet. Founded in 1994 and incorporated in 2000, Astraware is a UK-based games studio that develops, publishes and distributes games for a wide range of smartphones and mobile devices. Some of the titles to come out of the Astraware studio include multi-award-winning Astraware Sudoku, Tradewinds 2 (developed under license from Sandlot Games), and Pazzazz Games' GTS World Racing. Mobile gaming enthusiasts have downloaded more than 75 million copies of Astraware's products, and the company has customers in more than 100 countries. For more information visit: http://www.astraware.com. Facebook: http://www.facebook.com/astraware. Astraware® is the registered trademark of Astraware Limited in the U.S. and other territories. All rights reserved. All other trademarks belong to their respective owners. Barnes & Noble's NOOK brand of eReading products makes it easy to read what you love, anywhere you like™ with a fun, easy-to-use and immersive digital reading experience. With NOOK, customers gain access to Barnes & Noble's expansive NOOK Bookstore™ of more than two million digital titles, and the ability to enjoy content across a wide array of popular devices. The award-winning NOOK Color™ Reader’s Tablet™, the best-value on the tablet market ($249), features a stunning 7-inch VividView™ Color Touchscreen to read all of the content you love, shop popular apps, connect via email, browse the Web and more. The All-New NOOK ($139), the Simple Touch Reader™, is the easiest-to-use 6-inch touch reader, with the longest battery life of any eReader. In Barnes & Noble stores, NOOK owners can access free Wi-Fi connectivity, enjoy the Read In Store™ feature to read NOOK Books™ for free, and the More In Store™ program, which offers free, exclusive content and special promotions. Barnes & Noble was the first company to offer digital lending for a wide selection of books through its LendMe® technology, available through NOOK eReading products. Find NOOK devices in Barnes & Noble stores and online at www.BN.com, as well as at Best Buy, Walmart, Staples, Books-A-Million, OfficeMax and Fred Meyer stores. In addition to NOOK devices, Barnes & Noble makes it easy for customers to enjoy any book, anytime, anywhere with its free line of NOOK software, available at www.bn.com/freenookapps. Customers can use Barnes & Noble's free eReading software to access and read books from their personal Barnes & Noble digital library on devices including iPad™, iPhone®, iPod touch®, Android™ smartphones and tablets BlackBerry®, PC and Mac®. Lifetime Library™ helps ensure that Barnes & Noble customers will always be able to access their digital libraries on NOOK products and software-enabled devices and BN.com. Barnes & Noble also offers NOOK Study™ (www.nookstudy.com), an innovative study platform and software solution for higher education, NOOK Kids™ (www.nookkids.com), a collection of digital picture and chapter books for children, and NOOK Books en español™ (http://www.barnesandnoble.com/ebooksenespanol), the first-ever Spanish language digital bookstore in the United States. Barnes & Noble, Inc. (NYSE:BKS), the world's largest bookseller and a Fortune 500 company, operates 705 bookstores in 50 states. Barnes & Noble College Booksellers, LLC, a wholly-owned subsidiary of Barnes & Noble, also operates 636 college bookstores serving nearly 4.6 million students and faculty members at colleges and universities across the United States. Barnes & Noble conducts its online business through Barnes & Noble.com (www.bn.com), one of the Web's largest e-commerce sites, which also features more than two million titles in its NOOK Bookstore™ (www.bn.com/ebooks). Through Barnes & Noble’s NOOK™ eReading product offering, customers can buy and read eBooks on the widest range of platforms, including NOOK eBook Readers, devices from partner companies, and hundreds of the most popular mobile and computing devices using free NOOK software. General information on Barnes & Noble, Inc. can be obtained via the Internet by visiting the company's corporate website: www.barnesandnobleinc.com. The All-New NOOK™, The Simple Touch Reader™, NOOK™, NOOK 1st Edition™, NOOK 1st Edition Wi-Fi™, NOOK Color™, Reader’s Tablet™, Fast Page™, NOOK Books™, NOOK Bookstore™, NOOK Newsstand™, NOOK Magazines™,NOOK Newspapers™, NOOK Apps™, PubIt!™, NOOK Kids™, Read In Store™, More In Store™, NOOK Friends™,LendMe®, NOOK Library™, NOOK Boutiques™, The Barnes & Noble Promise™, NOOK Books en español™, NOOK Study™, Free Friday™, Lifetime Library™ and Read What You Love. Anywhere You Like™ are trademarks of Barnes & Noble, Inc. Other trademarks referenced in this release are the property of their respective owners.